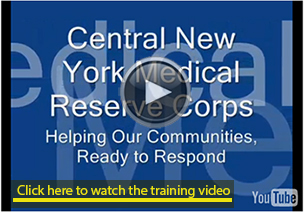 What training is needed as a member of the CNYMRC? Emergency preparedness and response requires coordinated efforts to allow communities to maximize resources during times of extraordinary difficulties and stress. You may already know how to perform some of the medical and health functions that may be needed. In most cases, MRC volunteers focus primarily on learning local emergency and healthcare procedures, basic public health measures, comprehensive support to people affected by disaster, and use of specialized equipment to enhance their effectiveness as volunteers. Perhaps the most important part of MRC training is learning to work as a team. An organized, well-trained MRC unit is familiar with the community’s response plan and partners, knows what resources are available, and understands where its skills can be put to best use in a coordinated manner. To receive credit for viewing the CNYMRC Orientation Video below, you must complete the short survey at www.surveymonkey.com/s/CNYMRCorientation following the completion of the video. Remember to complete the short survey following the video—click here. Thank you!